Welcome to the Home of the REAL Douay-Rheims Study Bible. What is the REAL Douay-Rheims Study Bible? The Original & True Rheims New Testament of 1582 is Now Available! DOUAY RHEIMS BIBLE IN PRINT! The Original & True Douay Rheims Bible is now available in a printed edition! Order your printed edition of The Original and True Douay Rheims Bible of Anno Domini 1610 here! St. Jerome at work on the Vulgate In AD 382 Pope St. Damasus commissioned St. Jerome (Hieronymous), the leading biblical scholar of his day, to produce a translation of the Bible to replace the Old Latin Bible, which had become corrupted through copyists' errors. A man who is well grounded in the testimonies of the Scripture is the bulwark of the Church. St. Jerome applying himself to the task by papal warrant had access to the best extant manuscripts -- which were much closer to the original manuscripts in Hebrew, Greek and Aramaic than anything still existing today. In many cases the New Testament scriptural texts were within a few generations of the original manuscripts penned by the Apostles. Finally completing his work in AD 405, St. Jerome gave the Catholic Church the Latin Vulgate. The Vulgate was solemnly proclaimed the Church's official Bible by the Council of Trent; which also declared that St. Jerome's Vulgate was the only authentic Latin text of the Scriptures. The word Vulgate itself means the "vulgar" --- that is the common Latin language in usage throughout the lands of the Roman Empire by the common people. The Vulgate was everywhere accepted, the majority of whom became the Greek Orthodox. The Greek bishops, because their texts had become so corrupted as to not be reliable, translated the Vulgate back into the "original Greek" for their use; which was the "Greek Text" in use at the time of the Reformation. The Vulgate was in use everywhere for 1,100 years as the standard Bible of all Christians; until various other Bibles began to appear during the Protestant Reformation. Cover of the Latin Vulgate Bible These either claimed to be translations of the Vulgate, or to be "diligently compared with the original Hebrew and original Greek manuscripts". In point of fact, well before the Protestant Reformation, there were no "original Hebrew and original Greek manuscripts" in existence, except in their claims --- neither have any original manuscripts been discovered to this day. From 1534 when Luther completed his corrupted Bible, which was followed by that of Wycliffe, Coverdale, etc., these partisan translations multiplied. And so the English College at Rheims undertook the translation of the Vulgate into the common man's English so that everyone could understand God's Holy Word arightly. 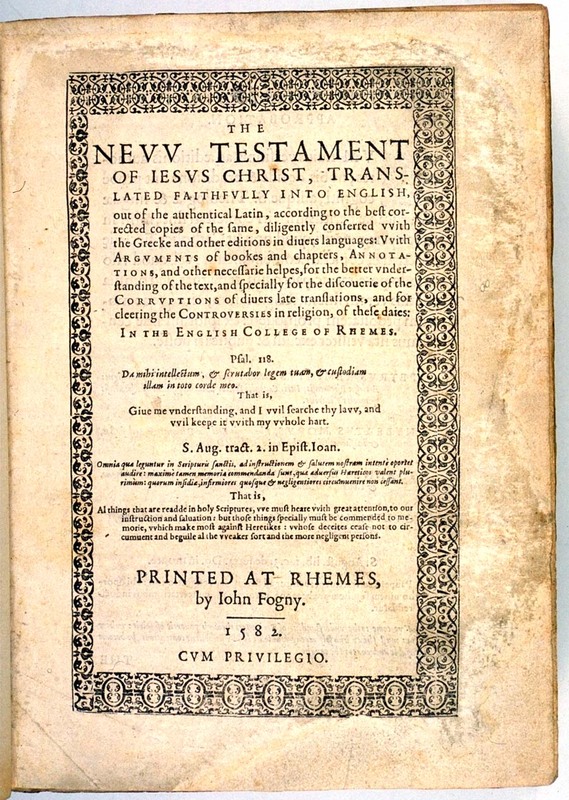 The result was the Rheims New Testament (1582) and, after the move to Douai, the Douay Old Testament (1609). This Douay-Rheims Bible became the gold standard --- the authentic translation --- of the Bible for English speaking Catholics and all who valued scriptural integrity. being more sovereign against the same (if it be used in order, discretion, and humility) than the true, faithful, and sincere interpretation opposed thereunto ... We, therefore, having compassion to see our beloved countrymen, with extreme danger of their souls, to use only such profane translations and erroneous men's mere fantasies, for the pure and blessed word of truth, much also moved thereunto by the desires of many devout persons, have set forth for you, benign readers, the New Testament to begin withal, trusting that it may give occasion to you, after diligent perusal thereof, to lay away at least such their impure versions as hitherto you have been forced to occupy." "Now since Luther and his followers have pretended that the Catholic Roman faith and doctrine should be contrary to God's written word, and that the Scriptures were not suffered in vulgar languages, lest the people should see the truth, and withal these new masters corruptly turning the Scriptures into diverse tongues, as might best serve their own opinions, against this false suggestion and practice, Catholic pastors have, for one especial remedy, set forth true and sincere translations in most languages of the Latin Church." Not a Typical Translation or "Version"
It must be noted that the Douay-Rheims is NOT a typical translation where the translator rearranges the words and meanings, but a "slavish", i.e., an exact translation without liberties from the Latin into English. The reader thereby has an exact understanding of what the original Latin says, rather than interpretations and interpolations. The year 1558 A.D. marks the beginning of increasing hardships and persecution in England for followers of the Vulgate. Some were forced to flee to the European mainland for safety. Some went to Douai, France, where a college had been founded for the training of missionaries to return to England; of which many were martyred. It was there, ten years later, that Gregory Martin began to translate the Latin Vulgate into English. As noted, the Rheims New Testament was published in 1582 A.D. in a single volume. For want of finances, the Old Testament was not published until the first volume appeared in 1609 A. D., and the second volume completing the Old Testament in 1610 A.D.
One year later, in 1611 A.D., the Protestant King James Version, also known as the Authorized Version, was issued; but the Catholic Douay-Rheims was not allowed legal entry until the 18th century. The King James Version was virtually a translation from Luther's German to English, and NOT "diligently compared with original Hebrew and Greek" as it claimed --- there being no complete original Hebrew or Greek manuscripts in existence either then or now. The Douay-Rheims Bible was specifically created for distribution in England. However the stringent Protestant Penal Laws in England forbade the entrance and ownership of this, God's Word. In fact, ownership of the Douay-Rheims by an Englishman was considered inimical to the English government and highly treasonable, for which one could be put to death. -- An interesting contretemps from those who claimed to be setting God's Word free. Needless to say, the appearance of this New Testament, with its annotations, at once aroused the fiercest opposition. Queen Elizabeth ordered the searches to seek out and confiscate every copy they could find. If a priest was found in possession of it, he was forthwith imprisoned. Torture by rack was applied to those who circulated it.... All these measures, be it noted, kind reader, were taken by parties who advocated loudly the unlimited right of private judgment. The King James Version was thus permitted to stand without competition and comparison with the Latin Vulgate or the English Douay-Rheims. Since the King James Version of 1611 A.D., it was as though Luther's "Bible" was the Bible of 1,100 years, and not the Latin Vulgate. If one's salvation depends upon the proper acceptance and application of Christ's teachings in one's life; then it is evident that the right understanding of the Word of God must be attained. But what if the Bible were to be cut and pasted, edited, re-interpreted, and otherwise changed --- all the while keeping the same name, but not the same substance. What effect would this have upon a godly man attempting to live the life of Christ? This is, of course, the reason we are given as to why there are so many versions of the Bible about --- to allow one to get closer to the real and true meaning of God's Word. Thus we have Luther's Bible, the King James Version (the Authorized Version), the Wycliffe, the Great Bible, and the Coverdale Bible from the Protestant Reformation. More recently we have the Scofield Bible, the Revised Standard Version, the Amplified Bible, the Living Bible, the Lamsa Bible, the New Century Version, the New International Bible, the New American Standard Version, the Thompson Chain Reference, the Nave Study Bible, and on and on. Each of these bible versions claims to take the Believer closer to the true meaning and essence of the Word of God. However, suppose that you have not considered, or have been denied, the best text of Scripture, and even the best helps that you need to understand God's Word arightly. What if the text of Holy Scripture had been changed to purge Jesus from Scripture, not just in the current anti-Christian era, but from the 1500's continuing until today under various forms of "textual criticism", updating, and other terms hiding what has been done? As one Minister states "It is, therefore, imperative that every child of God takes great care that the Bible version which he uses, defends, and promotes in the world is a faithful translation of the Word of God." For example, let us consider the determination to dissolve Christ from the Old Testament. This is plain in the King James Version (Authorized Version), where the various names of our Lord and Saviour, Jesus Christ, are removed more than 100 times. 21 times the name Christ is deleted, where it appears in the Vulgate and Douay. of The Noble One, 1 time; and, of The Orient, 1 time. But God says. . .
God says: "...neither add anything, nor diminish." De. 12:32. "You shall not add to the word that I speak to you; neither shall you take away from it." De. 4:2. "Add not anything to his words..." Pr. 30:6. "If any man shall add to these things, God shall add upon him the plagues written in this book." Apoc. [Rev.] 22:18. If the name of "God my JESUS" were in the Old Testament, would you expect Luther to retain it? If so, you would be disappointed! "Ego autem in Domino gaudebo. Et exsultabo in Deo Iesu meo." "But I will joy in our Lord, and will rejoice in God my JESUS." "Aber ich will mich freuen des Herrn, und froehlich sein in Gott meinem Heil." "In God, my salvation." Furthermore, this was not the only occasion that he did it. The name CHRIST is found 21 times in the Old Testament. Luther rendered it Judaistically "Messiah" once, "Christ" twice, and he rendered it out 18 times. He then blotted out the name CHRIST 24 times in the New Testament. Then, forty-five (45) times, Martin Luther took the name JESUS out of the New Testament! It is extremely important, of course, to comply with the words of Jesus that we change not a single word of His; however, the name JESUS can be much more important in one verse than in another! JESUS is taken out by Luther in his "Bible," in: Mt. 5:1; 8:26; 9:23; 16:15; 17:19; 20:17; 22:20; 26:18; Mk. 9:15; 16:1; 16:19; Lk. 4:38; 6:11; 14:1; 18:31; 20:3; 22:2; 24:36; Jn. 2:8; 4:1; Acts 5:41; 9:17; 9:20; 10:48; 16:7; 18:4; 18:25; 24:24; Rom. 8:34; 15:16; 16:9; I Cor. 4:17; II Cor. 2:14; Eph. 3:6; Phil. 3:9; Col. 1:7; 2:2; 4:12; II Thes. 2:8; Phile. 8; Heb. 4:14-16; 9:24; Jude 5,24,25; Hab. 3:18. CHRIST is taken out by Luther in his "Bible," in: I K. 2:10; 2:35; 12:3; 12:5; 16:6; II K. 22:51; II Par. 6:42; Ps. 2:2; 17:51; 19:7; 83:10; 88:39; 88:52; 131:10; 131:17; Is. 45:1; Lam. 4:20; Hab. 3:13; Acts 4:33; 10:48; 28:31; Rom. 3:26;4: 24; 8:35; 10:17; I Cor. 2:1; 4:16; 5:5; II Cor. 5:15; 11:4; Gal. 4:31; Eph. 5:21; 5:29; Col. 3:15; 3:17; I Thes. 4:17; Heb. 10:19; 13:20; I Pet. 3:15; Jude 24, 25; Apocalypse 11:15-19. JESUS is added by Luther in his "Bible," in: Mt. 8:5; 13:36; 13:51; 14:14; 14:25; 15:16; 15:30; 16:6; 17:11; 24:2; Mk. 5:19; 7:27; 10:50; 11:14; 11:15; Lk. 7:22; 8:35; 10:21; 10:39; 10:41; 13:2; Jn. 4:46; 13:3; 19:23; 20:21; 21:17; Acts 3:26; 9:28; Eph. 3:9; I Jn. 5:20. CHRIST is added by Luther in his "Bible," in: Mt. 23:8; Mk. 13:6; Lk. 4:41; Jn. 4:42; Acts 16:31; Gal. 3:17; 4:7; Eph. 3:9; Jn. 5:20. Again, it should be emphasized that The King James Version is a virtual translation from Luther's German to English, and was not "diligently compared with original Hebrew and Greek" as was claimed. Why, simply because these "original" Hebrew and Greek manuscripts simply did not exist at that time. Similar forces attempting to bowdlerize and to water down Sacred Scripture were also at work within the Catholic Church after the penal laws were lifted in England. The authentic real "Douay-Rheims Bible" was never accepted in England, as all Catholic Bibles had been confiscated and burned. In the 18th century, Bibles appeared in England -- the work of a Bishop Challoner -- which were erroneously called The Douay-Rheims. These counterfeit versions were allowed circulation in England and its colonies. The real Douay-Rheims --- the original and true version --- vanished --- to be found only in museums and literary collections. Father George Leo Haydock attempted a partial restoration of the voluminous notes from the REAL Douay-Rheims with his 1852 "Haydock Bible". While it is an improvement over the standard Challoner version, it is still the Challoner translation and also lacks the massive notes and annotations as well. One may ask why the REAL Douay-Rheims has not been available to the public from the 1600's until the present day. Obviously there are many reasons, such as the Penal Laws, the Challoner version which falsely claimed the name "Douay Rheims", etc. An image of the old English script text in the REAL Rheims New Testament However, the major reason (other than the obvious efforts of the enemies of Christ to suppress it) is because it has never been retyped from the Old English script into modern English text to make it accessible to modern readers. Thus, it is extremely hard and tedious to read and understand. You may be wondering, "How much difference can there really be between the REAL Rheims New Testament and the King James?" Christians have been deceived into believing that their English Bibles were based on the true ancient texts which Christians have always used. Instead, what they have is really based on texts by people who did not mind changing holy Scripture so as to prove their theological contentions and remove Christ from His Scriptures. Only the REAL Douay-Rheims Bible is faithful to the ancient Latin Vulgate! This means you have access to the oldest authentic Bible texts available any where! Psalm 132:10 Propter David servum tuum non avértas fáciem christi tui. For David thy servants sake turn not away the face of thy Christ. Psalm 132:17 Illuc prodúcam cornu David; parávi lucérnam christo meo. Thither will I bring fourth a horn to David, I have prepared a lamp to my Christ. Isaiah 64:10 Cívitas Sancti tui facta est desérta, Sion desérta facta est, Jerúsalem desoláta est. The city of thy holy one is made desert, Sion is made desert, Jerusalem is become desolate. For a comparison of nine different Bible versions click here! In an effort spanning over eleven years, and as a corporal and spiritual work of mercy, Dr. William von Peters has prepared the Douay Rheims for modern readers. First hand retyping the REAL Rheims New Testament in its entirety, with all the notes and annotations, into modern English text for easy reading. Then continuing on with the REAL Douay Old Testament, also with notes and annotations. It is to be emphasized that nothing in the text has been changed or modified. It has only been transliterated into modern English text, with archaic spellings updated to modern spellings. Where possible the archaic spelling has been left intact to preserve the "flavor" of this historic text. "...At a single leap we thus arrive at that great work, completed by the greatest scholar of his day, who had access to manuscripts and authorities that have now perished , and who, living so near the days of the Apostles, and, as it were, close to the very fountain-head , was able to produce a copy of the inspired writings which, for correctness, can never be equaled." The New Testament is a fulfillment of the Old. Jesus said he came to fulfill the Law and the Prophets. 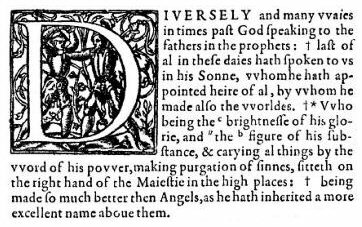 The first volume of the Douay Old Testament was printed in 1609 and comprises the Books of Genesis through Job. The second volume containing the rest of the Old Testament was printed the following year in 1610. Both pre-date the King James version of the Bible. The Douay comes to us from the Septuagint Old Testament which was the official Bible of the Pre-Christian Era Jews, as well as of the New Testament Christians. The Septuagint was early on translated into the Old Latin Version for the Roman World for whom Latin was the official language; as Greek had been prior to the coming of the Roman Empire when the Septuagint had been translated from the original Hebrew (now lost). St. Jerome revised the Old Latin with the use of the most ancient manuscripts available into what became known as the Latin Vulgate. The unique notes and annotations of the Douay tie together the Old and New Testaments so that you can now understand God's wonderful plan of Salvation! Now you can understand how the New Testament Church -- the Catholic Church -- is the culmination and continuation of Old Testament Israel -- and why the Church Fathers stated that the Church is Israel! The Douay Rheims Bible was translated meticulously to preserve the absolute meaning of the text, not interpreted. Numerous Protestant authors have remarked upon this fidelity. Here are a few notes in this regard. When the Latin was capable of guiding them, they seem to have followed out their principles honestly: but whenever it was inadequate or ambiguous they had the niceties of the Greek at their command. Their treatment of the article offers a good illustration of the care and skill with which they performed this part of their task. The Greek article cannot, as a general rule, be expressed in Latin. Here then the translators were free to follow the Greek text, and the result is that this critical point of scholarship is dealt with more satisfactorily by them than by any earlier point of translators. And it must be said also that in this respect the revisers of King James were less accurate than the Rheimists, though they had their work before them." Quoted in Carleton, The Part of Rheims in the Making of the English Bible, p. 19 and Moulton, The History of the English Bible, p. 19. "Scrupulous or even servile adherence to the text of the Vulgate was not always without advantage. They frequently reproduced with force the original order of the Greek which is preserved in the Latin; and even while many unpleasant roughnesses occur, there can be little doubt that their version gained on the whole by the faithfulness with which they endeavoured to keep the original form of the sacred writings. . . . The same spirit of fidelity to the letter of their texts often led them to keep the phrase of the original where other translators had unnecessarily abandoned it." Ibid., pp. 245, 249, 255: Matt. 18:29, 24:7, Luke 16:9,: Rom. 1:21, 11:2. "In addition to the Vulgate," says Isaacs, "the Greek text was closely consulted and produced improved renderings of the article, not without effect on the Authorized and Revised Versions"
(in The Bible in Its Ancient English Versions, p. 193. "is highly commendable for its scrupulous accuracy and fidelity. In justice it must be observed that no case of willful perversion of Scripture has ever been brought home to the Rheimish translators." A Supplement to the Authorized English Version of the New Testament. "In some places the Douai Bible more accurately hands down the very words of the inspired writers than any English translation then existing. This is owing to the Latin having been taken from earlier MSS, than were accessible to later translators." "...a most accurate and scholarly version . . . by thoroughly competent Greek scholars, who carefully compared the Latin with the Greek . . . In the representation of a simple Greek word occurring in various places by the same English word, in careful discrimination of the senses of the definite aricle, and in regard of the original form, express, and order of words, this version is far superior to any previously existing. As to the English style of it, a very false impression is created by the usual descriptions. It does not doubt maintain a certain number of unfamiliar words which it was thought could not be rendered into common English without losing their theological or ecclesiastical associations; but in the Gospels and the simpler portions of the Epistles we may read for a long time without finding anything unusual in the diction; and such words as "evangelise" and "Paraclete" need not seriously offend us. By far the most shocking instance is "supersubstantial bread" in the Lord's Prayer; but the translators were dealing with a difficulty which had been rather evaded than solved by their predecessors. . . . It is needless here to do more than to mention the considerable owed by our Authorized Version to the Rhemist translation." The English Bible, in the Quarterly Review, October 1911. So even great Protestant Scholars are not afraid to praise the Douay Rheims. "no version is freer from prejudice than the Vulgate owing to its antiquity and the fact that it antedates the Western schisms." All students of the Bible seeking to diligently ascertain the Word of God and its meaning, whether Catholic or Protestant, should have a copy of this monumental work which brings the Bible directly from the time of St. Jerome's Vulgate of A.D. 385 to you today in the 21st Century. As a Study Bible it is without comparison, quoting the Apostles, Fathers of the Church, Saints and Sacred Councils. This information is simply not available in any one source elsewhere. Now you can have it for your studies and prayers --- and to build your Faith. The Rheims New Testament is now available either as a download, or on CD in Adobe pdf format for everyone to read, study, and learn from. As a pdf file it can be easily searched to find verses, subjects and notes. The Douay Old Testament is being prepared as you read. It will be published in two volumes, as was the original. This project of many years effort has borne fruit in bringing forth the authentic Word of God from St. Jerome's Latin Vulgate to the Rheims New Testament --- some 2,000 years --- for your edification, study and knowledge. to be ignorant of the Scripture is not to know Christ. We must believe all that God has revealed which He made known for our very salvation by the Patriarchs and Prophets, and at last by His Son Jesus Christ and the Apostles. In the early centuries of Christianity, the Holy Bible was the only book which was read in homes. It was read daily to the entire family - even the youngest children, so before they had to attend pagan schools they were well prepared, because they knew Holy Scripture by heart and thus were able to easily defend and profess their Christian Faith, and to even die for it. True Holy Scripture as God's Word, along with Apostolic Tradition, has always led Christians as the pillar of doctrine and Faith. Today, however, it is perhaps even more vital and necessary to each of us as we move ever closer to the culmination of history in these End Times. As the Testament of the New Covenant of Jesus Christ, the Rheims New Testament belongs in your library. This monumental Rheims New Testament --- reappearing in these End Times some 423 years after its publication in 1582 --- is modestly priced for everyone's budget. 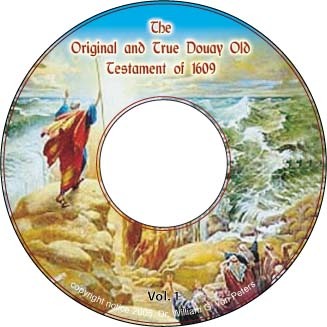 You may purchase the Douay Old Testament of 1609 volume I (Genesis - Job), Douay Old Testament of 1610 (Psalms - IV Esdras), and the Rheims New Testament in one of three ways: Download, CD alone, or both CD and Download. Many of you have asked repeatedly when the original & true Douay Rheims Bible would be available in a printed edition. You see, many people simply do not like to read off of the computer screen. Either the screen bothers their eyes, or they can't read for long periods due to the back lighting; even though the electronic edition allows for convenient search capability and the ability to adjust the font sizes for better viewing. Also, many feel that there is nothing like holding the actual text in one's hands and savoring the printed word; particularly when it is God's Holy Word. The ability to "print on demand" means that the book, in this case The Original & True Rheims New Testament of Anno Domini 1582, or the original & true Douay Old Testament of 1610, can be printed professionally by an actual printer on an 'as ordered' basis so that large quantities don't have to be printed in advance to fill orders. With that capability in mind the Douay Rheims Bible is printed in 8-1/2 inch by 11 inch format for very easy reading. Even the Notes are large enough to read easily, unlike the notes of the 'Haydock Bible'. And, we have designed an attractive soft cover worthy of the volume. A thumbnail photo of the Rheims New Testament is to the left. The Downloads are available immediately after purchase, and the CDs normally ship next day. The Printed Edition normally takes 1-2 weeks to arrive. You may order your softcover printed edition of The Original and True Douay Rheims Bible of Anno Domini 1610 here! P.S. -- Free Gifts for you with your purchase! With the CDs and Downloads we have some gifts for you. 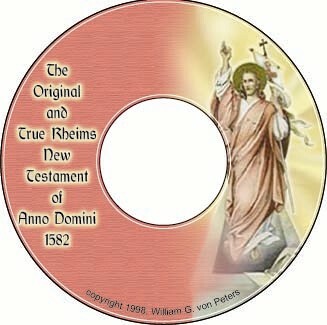 When you order The Original and True Rheims New Testament of Anno Domini 1582 as either a CD or Download (or combination) you will also receive, free of charge the Douay Catechism of 1649. This catechism is like none you have ever seen. Most catechisms are for Catholics to learn Catholic doctrine. The Douay Catechism is to explain Catholic doctrine to Protestants! You will learn a lot about your Faith from this wonderful Catechism that you have never heard explained in this way. The Douay Catechism is from the Douay College that gave us the Douay-Rheims Bible. FREE! when you purchase the Rheims New Testament. Order Now! When you order The Original and True Douay Old Testament of Anno Domini 1609 (vol. 1) as either a CD or Download (or combination) you will also receive, free of charge a PDF copy of Where We Got The Bible by Rt. Rev. Henry Graham. This book provides an excellent understanding of the history of the Bible. Have you ever wondered how the Bible was put together? How and why certain books made it into the Bible while others did not? What are the Deutero-Canonical Books? You will find your answers in this book. FREE! when you purchase the Douay Old Testament vol. 1. Order Now! When you order The Original and True Douay Old Testament of Anno Domini 1610 (vol. 2) as either a CD or Download (or combination) you will also receive, free of charge a PDF copy of Europe and the Faith by Hilaire Belloc. Ever wonder how important the Christian Faith was to the development of Europe, and thereby the European colonies which developed into the United States, Canada, etc.? Belloc shows that without the Faith there is no "Western Culture". The Christian Faith and Western Civilization are of one cloth, inseparable. Now you will know why. FREE! when you purchase the Douay Old Testament vol. 2. Order Now! You can get all three free gifts with the purchase of both the Rheims and the Douay on CD or Download. Purchase them now for your family and loved ones! Note: Should you experience any problems ordering through PayPal please email us at: for assistance. Merry Christmas! -- Jesus is the Reason for the Season! Help us spread the good news of the REAL Douay Rheims! Here are two free brochures you can print and hand out. Download Matt. 24 - for free! Download Genesis 1 - for free! Order Rheims NT now and receive a copy of the Rheims Catechism, absolutely free! Order Douay OT vol. 1 now and receive a copy of the Where We Got the Bible, absolutely free! Order Douay OT vol. 2 now and receive a copy of the Europe and the Faith, absolutely free!